CooksRecipes has quality, kitchen-tested recipes for fan-pleasing dips, salsas and cheese spreads that you can count on for successful deliciousness. Here's a warmed-up version of the traditional spinach dip that is always a crowd-pleaser. 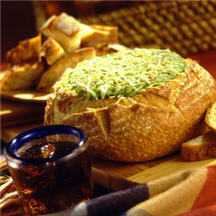 Choose an oval-style loaf of bread for a "football bowl" presentation. 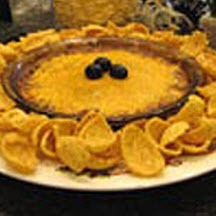 This super easy warm chili and cheese dip is a real crowd-pleaser - and is a must-have dip for Super Bowl parties. Love poppers? 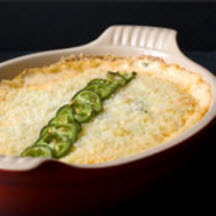 Then this warm jalapeño, cheddar and cream cheese dip, topped with crispy panko bread crumbs, is a must-try!